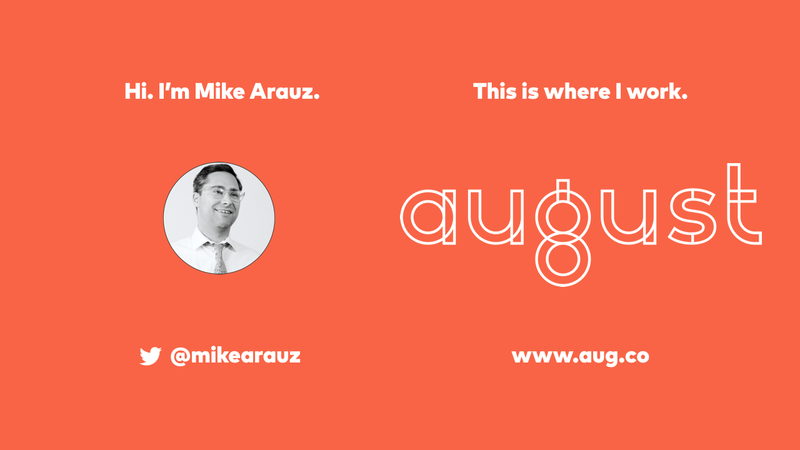 Hello, my name is Mike Arauz. I work at a consulting firm called August. 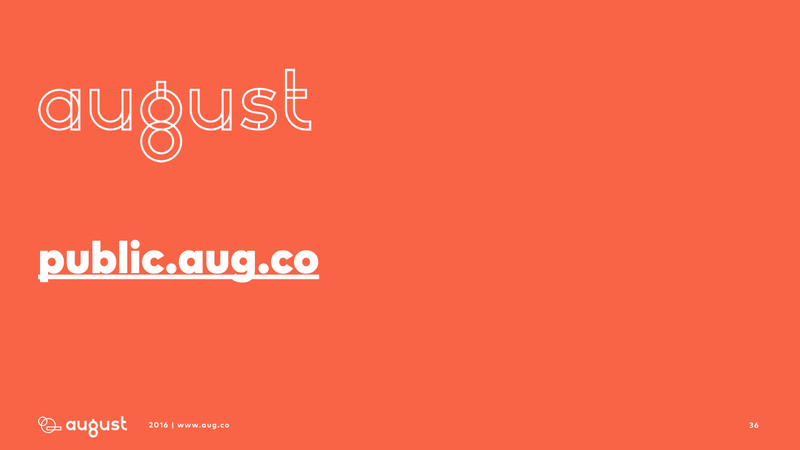 August helps companies thrive in the 21st century by building high-performing teams, and helping organizations to unlock their capacity to make a meaningful dent in the world. I’m really glad to be here today. Early in my career I was working at a retail design and brand strategy firm, and I was asked to be on the team for one of our biggest projects yet. One of the U.S.’s biggest clothing retailers had hired us to conduct a major consumer research study, and tell them what they could do to reconnect with their customers. Like many retailers, they had been around for a while and their customers had grown up, changed, and started to grow apart from the brand. So, myself and two teammates traveled all over the country interviewing customers, camping out in store entrances, and talking to everyone we could about their lives and their relationship to the brand and its products. It was an incredible experience. We talked to hundreds and hundreds of different people, and learned so much about those people, about the brand, about the industry, and even about the country. At the end of the project we had our final presentation, where we were going to share everything we had learned. And we were really excited — because, as I said, it was our biggest project yet and we were presenting directly to the CEO of the entire corporation and the new President of the brand. Now, importantly, this President had not hired us. The President was new, and we had been hired during the interim while the corporation was finalizing their search for a new President. So this President was new, and — in fact — their very first day on the job was the day of our big final presentation. You probably have a better sense for how these things work than I did at the time, and you can probably guess what happened next. Before we even walked in the door of that conference room this new President had already made up their mind about what the brand needed to do. It didn’t matter what we said or how insightful our findings were or what their hundreds of thousands of customers wanted. That President knew best. So… they didn’t take any of our advice. Over the next year their business tanked. And less than two years later that President had been fired. I wanted to share this story because I think it was indicative of that company’s inability to share and process information that might help them, inability to learn from what’s happening around them, and inability to empower the people already inside their organization to work together to achieve some collective success. Inability to share useful information; inability to learn; inability to empower people to help the organization be successful. I work with some of the largest companies in the world and my job is to help business leaders unlock the potential of their organizations. And what I see over and over again is that most companies share these same weaknesses, and that these weaknesses are at the heart of why companies struggle to keep up in the 21st century. And, meanwhile, the companies that are thriving in this new world that’s defined by disruption and constant change are the companies who excel at these new ways of working. 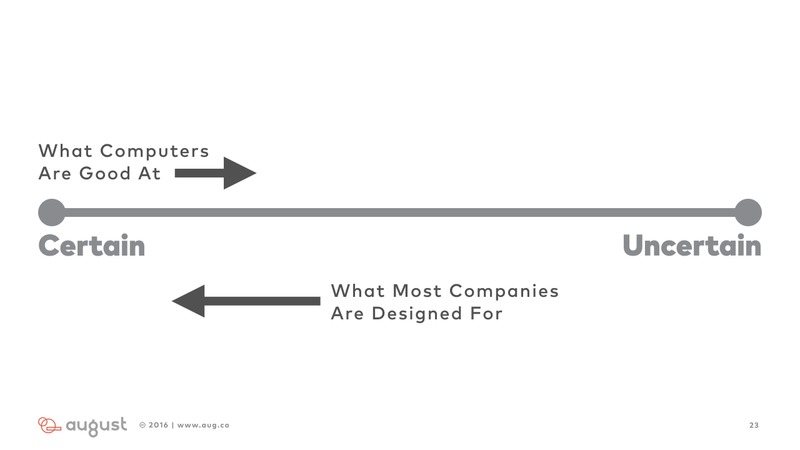 What separates the companies who are thriving in today’s world from those who are struggling? And what are some specific things that you can start doing today to change from one to the other? So, let’s start by talking about what work is like for most people inside most organizations today. I’m going to describe some common behaviors, and I’d like you to raise your hand if you’ve ever run into this where you work. 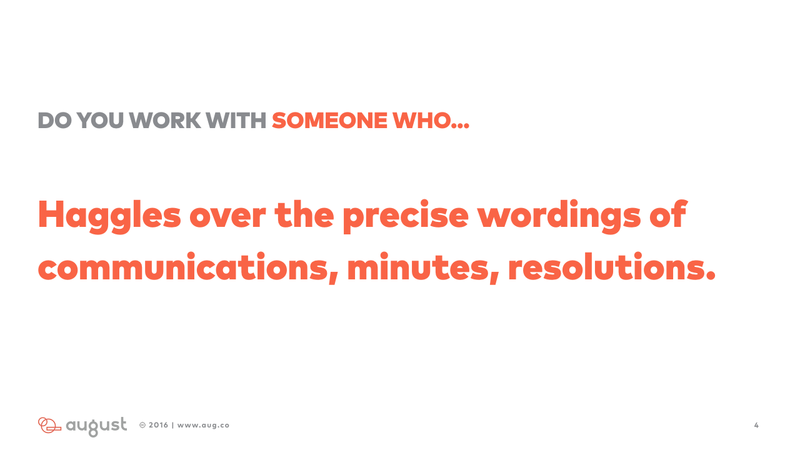 Haggles over the precise wordings of communications, minutes, resolutions. Refers back to matters decided upon at the last meeting and attempts to re-open the question of the advisability of that decision. Insists on doing everything through “channels.” Never permits short-cuts to be taken in order to expedite decisions. Your company is being sabotaged. 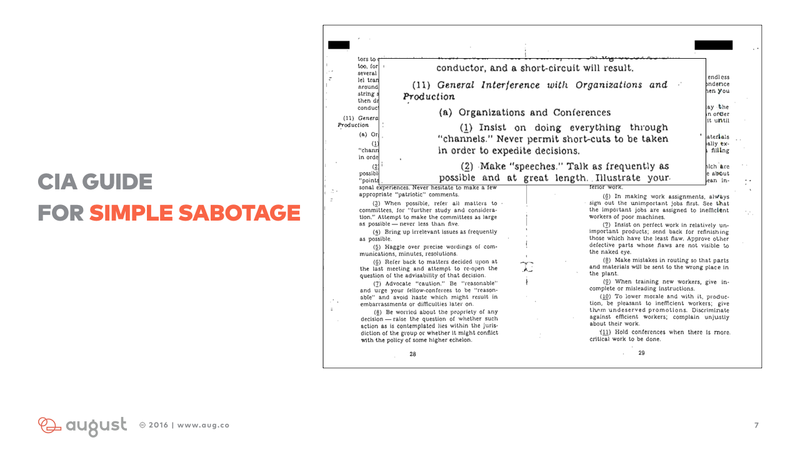 These statements are actual instructions from a CIA operative field manual, created in the 1940s, that tells agents what they can do to deliberately sabotage an organization from the inside out. And, sadly, they also happens to be just another day at the office for most of us. 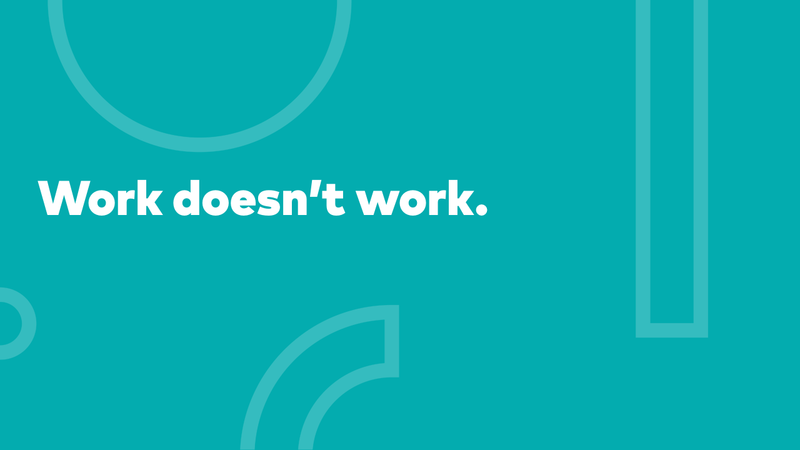 The reality for most people inside most organizations today is that work doesn’t work. The way we’re organized makes it harder for us to do our work instead of easier. 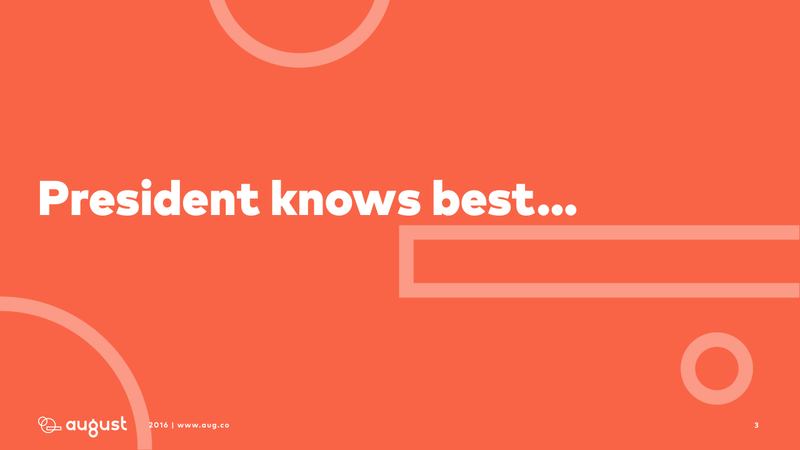 The way decisions are made slows things down when it should be speeding things up. And the way we collaborate and communicate with our teams makes us feel like we’d be better off working by ourselves than working together. 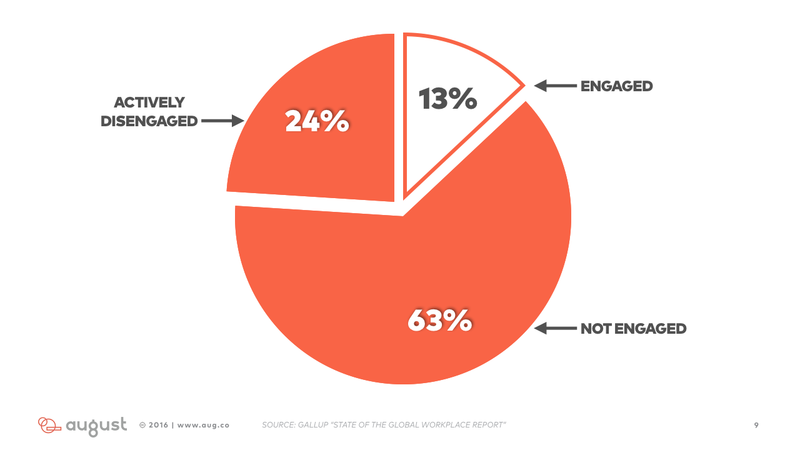 A Gallup global survey of employee engagement found that only 13% of employees are actually engaged at work. 63% are not engaged, and a shocking 24% are actively disengaged. No wonder it feels like someone is trying to sabotage us — 1 out of every 4 people is spending their days thinking about what they can do to escape. And organizations have run out of answers. 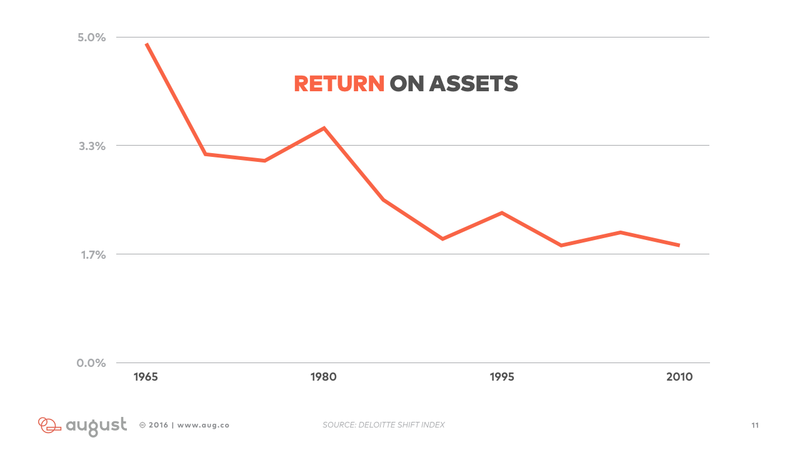 It’s harder than ever for companies to get a return on their investments. And it’s never been more challenging to compete in the market. 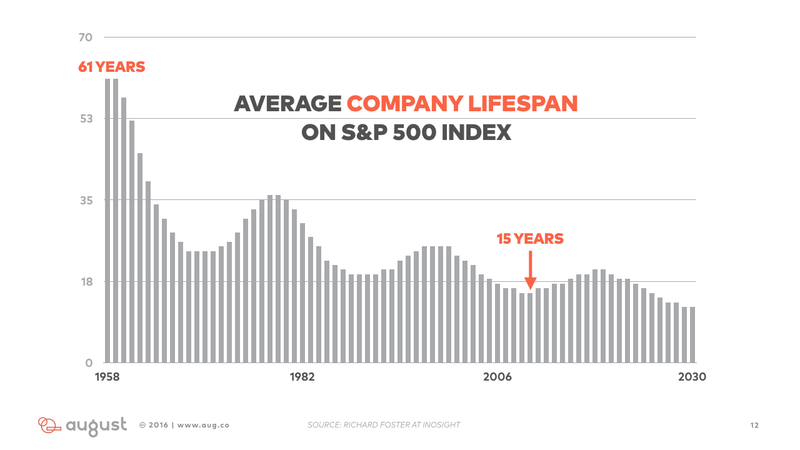 In 1958 the average lifespan of a company on the S&P 500 was over 60 years. Meaning once you made it on there, you could expect a good long run of prosperity. Today the average lifespan is just 15 years … and falling. 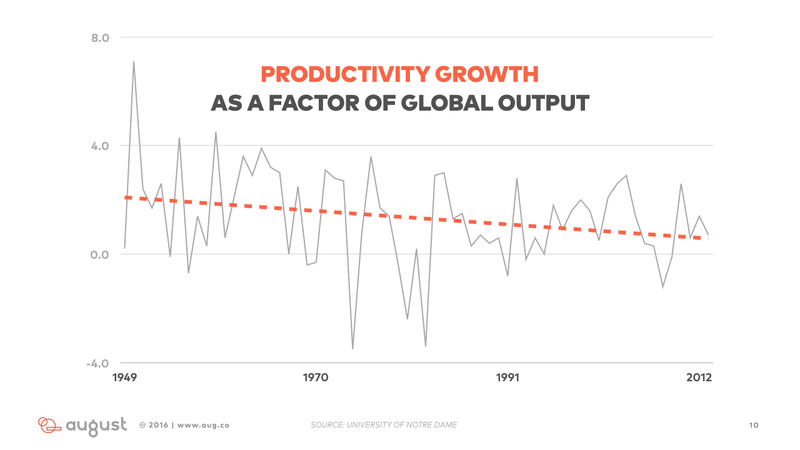 Most companies just can’t squeeze any more productivity out of their firms. And, yet… some companies can. 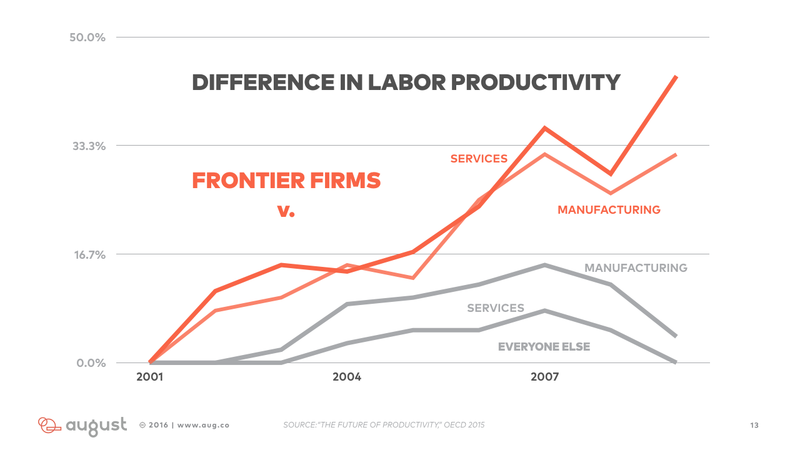 A recent study found that there is a small select group of “frontier” firms that have figured out how to unlock exponential productivity compared to everyone else. What’s going on? What happened? 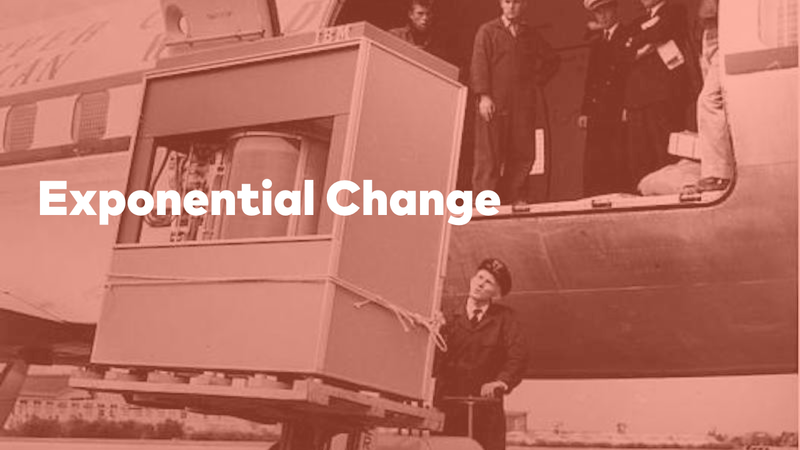 We now live in a world that is defined by exponential change. This exponential change is driven — not exclusively — but more than anything else by technological innovation. Moore’s Law states that the amount of computing power you can squeeze onto a computer chip doubles approximately every 18 months, while at the same time the cost is cut in half. This law has held true for the past 50 years. The hard drive in this picture is a 5mb hard drive. If I had wanted to send you this presentation file back then, I would have needed to fill an airplane with those hard drives in order to get it to you. This incredible breakthrough — and everything that it has touched since — has transformed our world. 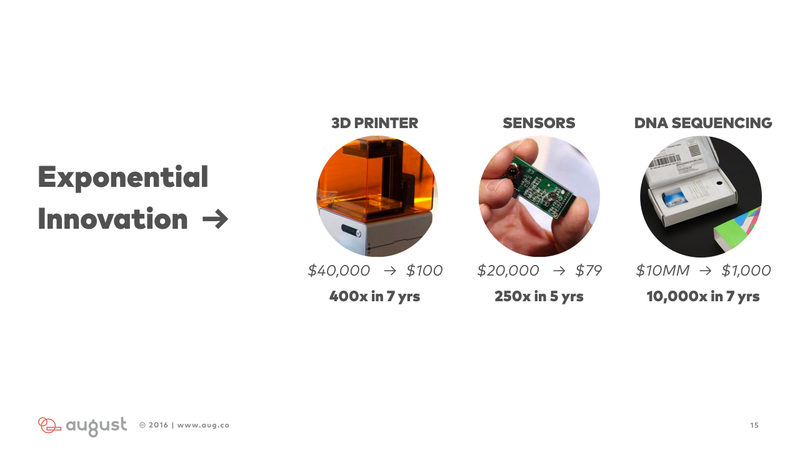 3D printers that used to cost $40,000 7 years ago now cost just $100. Sensors that we now have in nearly every device manufactured, used to cost $20,000, now cost just $79, just 5 years later. DNA sequencing that used to cost over $10 million now costs less than $1,000. A 10,000x improvement in just 7 years. 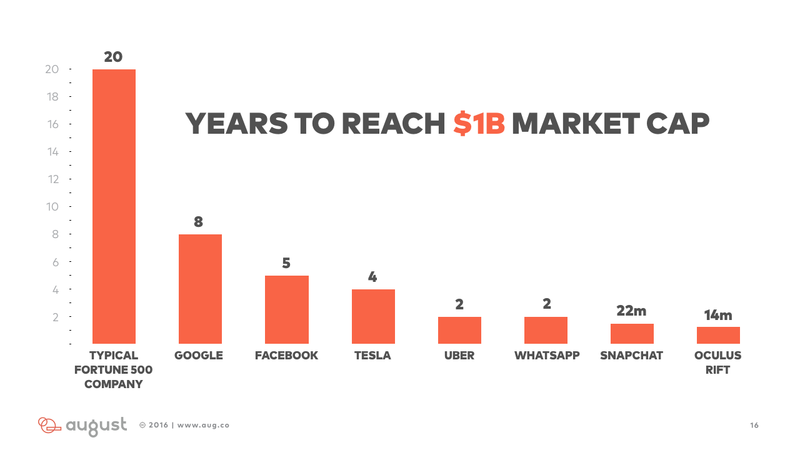 It took 20 years for the average company on the Fortune 500 to reach $1 billion in market cap. It took Google just 8 years. Oculus Rift: just 14 months!! And it’s never been easier to bring a product to scale. It took the telephone network 89 years to connect 150 million users. 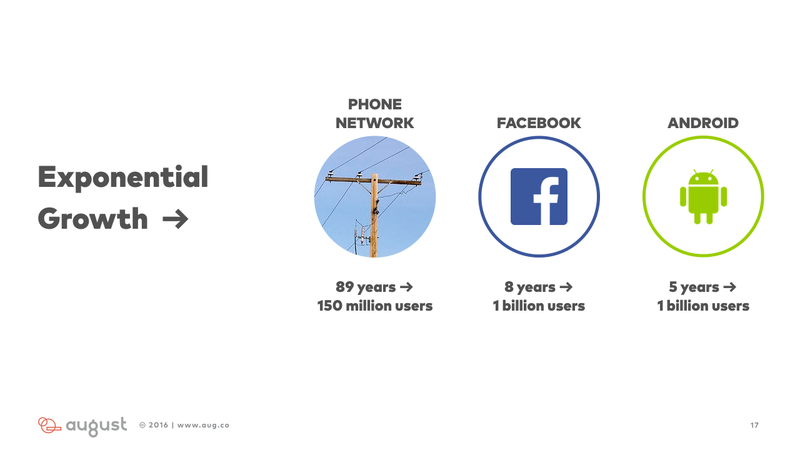 It took Facebook just 8 years to connect 1 billion users. And it took Android just 5 years to connect 1 billion users. 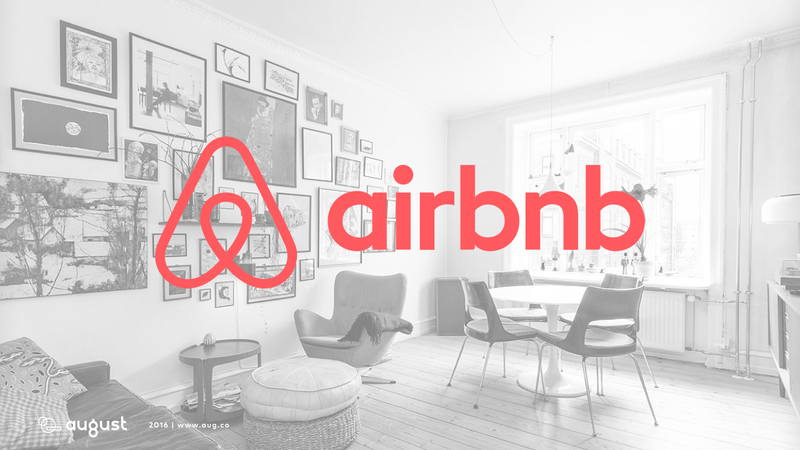 AirBnB now has more listings than any hotel chain in the world. They’re able to provide 100x more listings per employee than the average in the hotel industry. And they don’t own any real estate! The difference between these companies that are reaping all the benefits of this new world is that the way they work is fundamentally different. 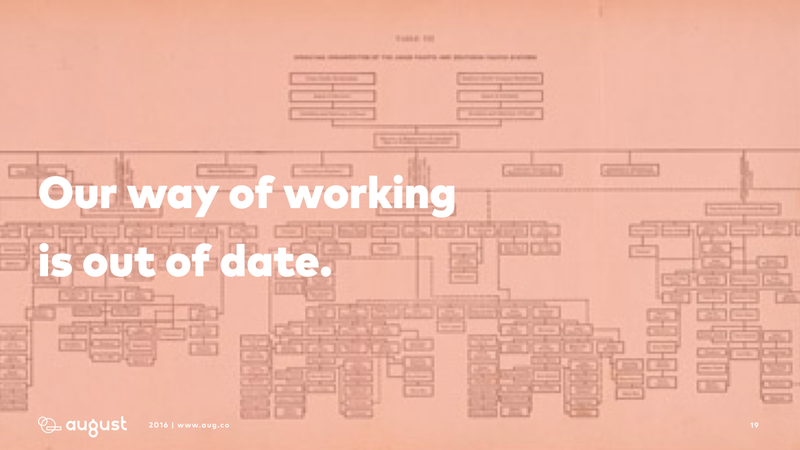 Unlike these successful companies, most companies today are still using an obsolete operating model that was designed over 100 years ago for a world that no longer exists. The image in the background of this slide is the organizational chart of the New York Erie Railroad, from the 1800’s!! And it pretty much looks like every other org chart you’ve ever seen. This industrial-era model worked really well for long time. In the 1900’s you could get a huge amount of value out of doing this better than your competitors. By developing proprietary methods and carefully protecting your IP. By scientifically breaking down work into small, repeatable tasks, and executing with reliability and efficiency at massive scale. By coordinating the work of thousands of employees across regions and functions through strict hierarchies and clear chains of command. And all of this worked really well in a time when it was possible and advantageous to try to predict the future. This model worked really well when it was possible and useful to try to be certain about what was going to happen next. This difference — between optimizing for certainty vs. optimizing for uncertainty — is at the core of what separates successful organizations from everyone else. 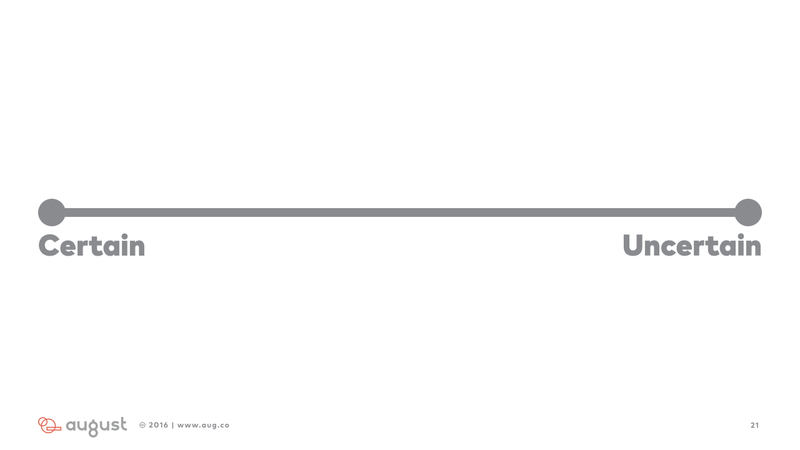 All work that you can think of can be placed along this spectrum. From the most routine tasks to the least routine. From the tasks where there is a well-known “right” way to do something to the tasks where the answers are complex and completely unknown. On the left, you have tasks like boxing widgets on a factory assembly line. You also have things like basic accounting, and drafting standard legal documents. And on the right, you have exciting world-changing things like trying to cure cancer or inventing a self-driving car. But, you also have things like figuring out what will be the best new IT system to implement for a mid-size corporation. 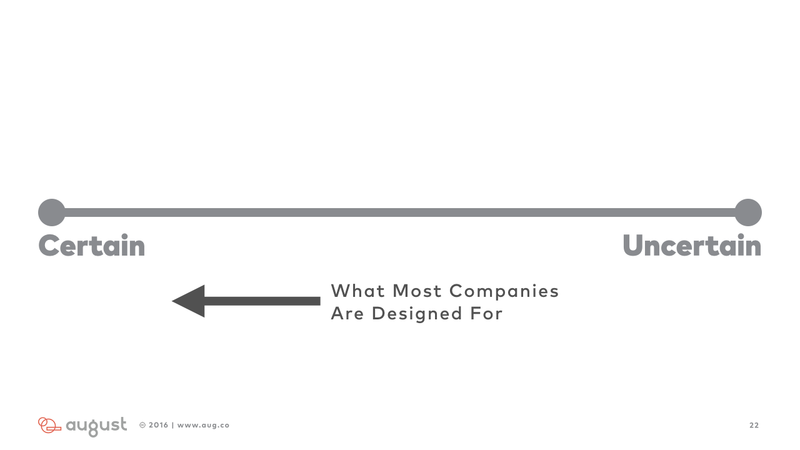 Most companies today are designed to operate really well at this certain end of the spectrum. At the routine end. Especially big global Fortune 500 companies, who are extremely good at maximizing the benefits of everything that lives here. But, guess what: that’s what computers are really good at. Computers excel at the most routine, most programmable tasks. And as computers get more powerful and artificial intelligence and robotics gets better and better, they will steadily eat the tasks along this spectrum from left to right. In fact a recent McKinsey study found that 45% of the things we do today can already be automated by existing technologies today. It’s no surprise then that most companies are finding it harder and harder to create any unique value at this end of the spectrum. Computers create exponential value, and very quickly those new technologies are available to everyone, preventing any one company from gaining a unique advantage. Meanwhile, human beings are really good at the least routine, most complex, most collaborative, most creative work. And we’re much better than computers at this stuff. This is the stuff that’s really hard for computers. And this is where teams and organizations of human beings — working together toward a shared goal — can create massive value. This is where the world-changing happens. But, sadly, most organizations that we work inside of are optimized for certainty, when they should be optimized for uncertainty. Optimizing for uncertainty looks different, and it’s what allows organizations to thrive in the face of constant change. If you want to optimize for uncertainty, you begin by defining a clear and specific collective purpose. 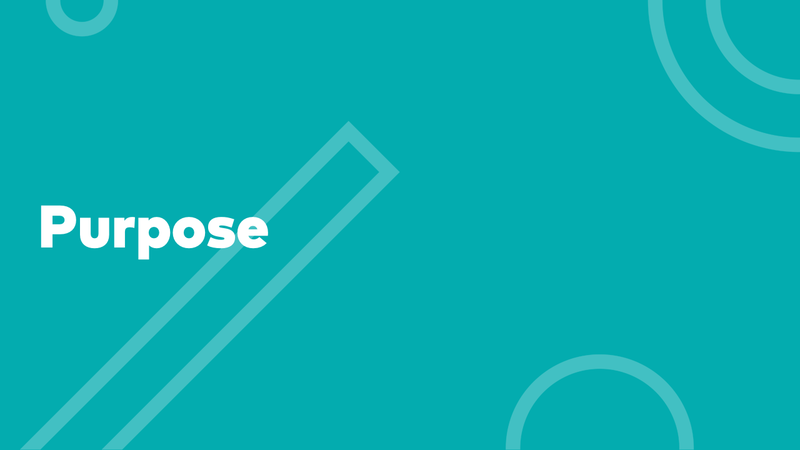 But, unlike the industrial-era purpose, this time your purpose invites people inside and outside the organization to be part of a meaningful mission beyond the bottom line. 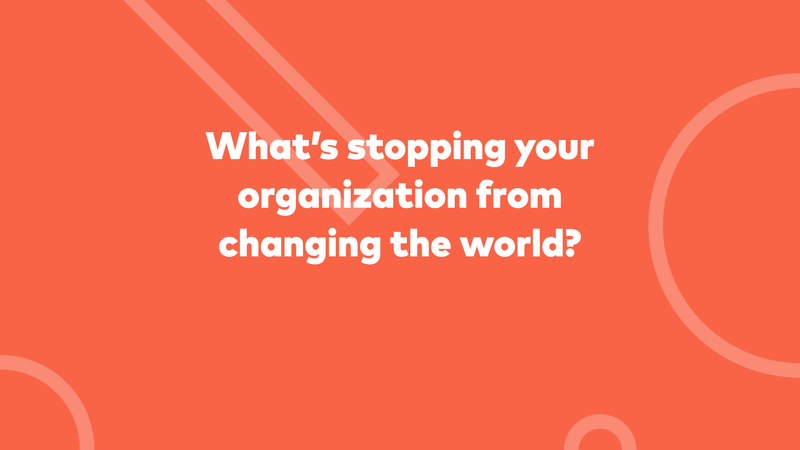 Your ability to empower people to contribute no matter who they are or where they are, and to break the limits hierarchy, functional silos, cultural norms, and even the organization itself. We call organizations who embrace this way of working “responsive organizations” because they are better able to sense and respond quickly to new opportunities, challenges, and changes in their environment. We’re not the only ones who have spotted this shift. 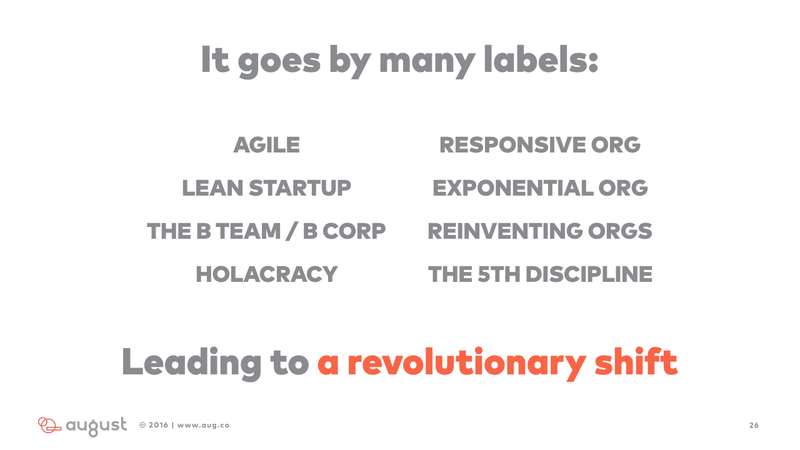 It goes by many labels — agile, lean startup, B-Corp, Holacracy, Exponential Orgs, Reinventing Orgs, The 5th Discipline, and others. These are all related and overlapping practices, and they are all part of a much bigger and lasting shift in the way we work. I believe that this is the beginning of a revolution. I believe that all of us, the people who work inside these organizations, will insist that things change. 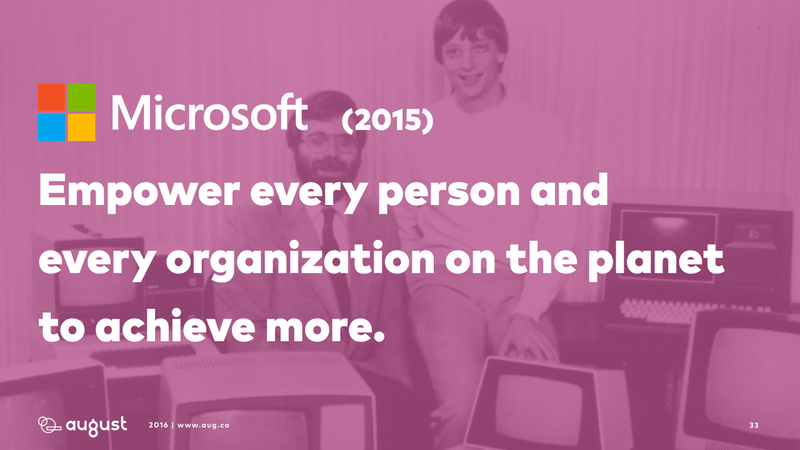 And that the organizations who embrace the change will thrive. And those that either resist it or ignore it, will die. The good news for you is that you can be part of this revolution. At August, we vehemently believe that it is possible for an organization — even big, old ones — to change from one to the other. From the old way to this new way. It’s still early days, and we are just beginning to learn the best ways to do this. But, already, we’ve identified some specific practices that can begin to move an organization towards responsiveness, and quickly unlock tangible benefits. Everything begins with purpose. This is your central reason for being; your collective “Why?”. It defines the true boundaries of your organization, and gives people a reason to contribute for more than just the paycheck. People want to be part of something bigger than themselves, and you can multiply both their engagement and their impact by helping them to align their personal mission with the mission of the organization. Responsive organizations have a clear and specific purpose that they use to guide decisions and align the actions of everyone who contributes. At August, our purpose is: a capable team for every meaningful mission. Importantly, it’s not perfect and it doesn’t have to be. It’s useful. First off, we need to figure out what makes teams capable. This is the essence of our work. It’s why we get out of bed every morning. And our purpose invites inquiry and learning, not just cookie-cutter solutions. Second, what makes a mission meaningful? Should we define it at the individual level? Is it the organization’s mission? Or does it have a social impact component? We don’t know, and that’s a good thing. We don’t know the answers, but we believe that we can create value for others by trying to find the answers, and rally an amazing community of people — inside and outside our company — to help us figure it out. Every time Elon Musk gets on stage to talk about Tesla, or introduce a new product, the first thing he does is remind everyone of this purpose. And it’s been public almost since the company launched. So, it shouldn’t come as a surprise to people when Tesla announces that they’re getting into the battery business. Efficient power storage is essential to sustainable transportation. 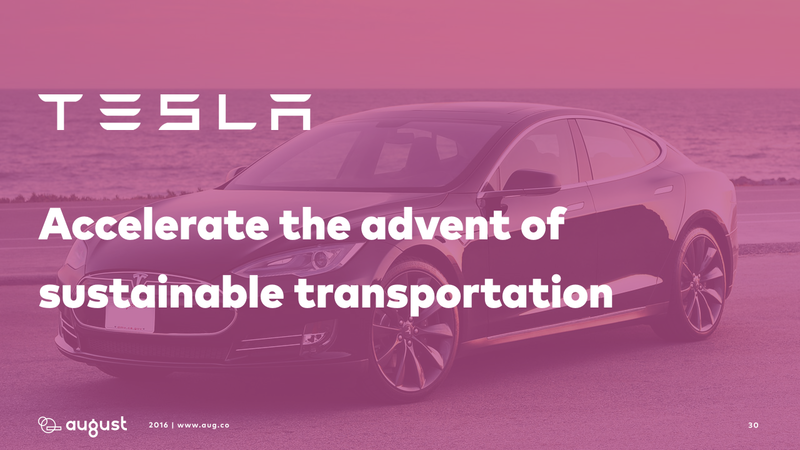 The batteries are what make Tesla’s cars so special, and it’s only natural that they would use this know-how to accelerate the adoption of electric vehicles and solar power generation and storage for homes. A little bit wordy, perhaps. But again, it’s what you do with it that’s important. 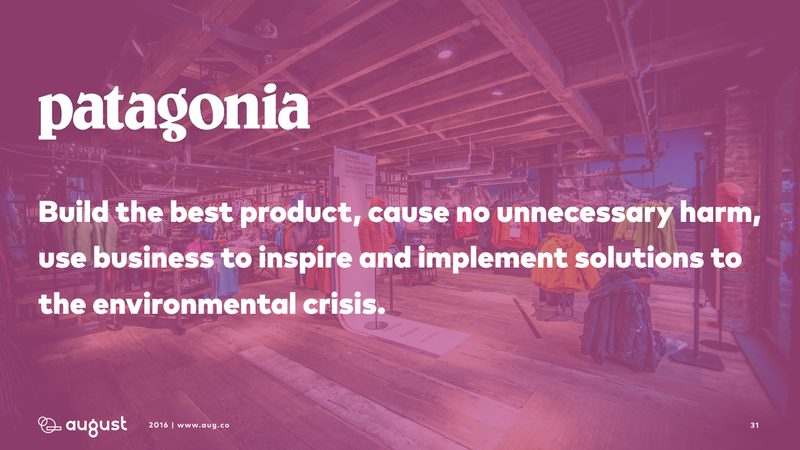 Last year on Black Friday, the big shopping holiday in the U.S., Patagonia celebrated with a letter from their CEO Rose Marcario urging customers to “become radical environmentalists” by repairing their worn clothes instead of buying something new. Their store employees are trained how to make repairs, and on their website they provide thousands of guides for customers to use to repair their own clothes. 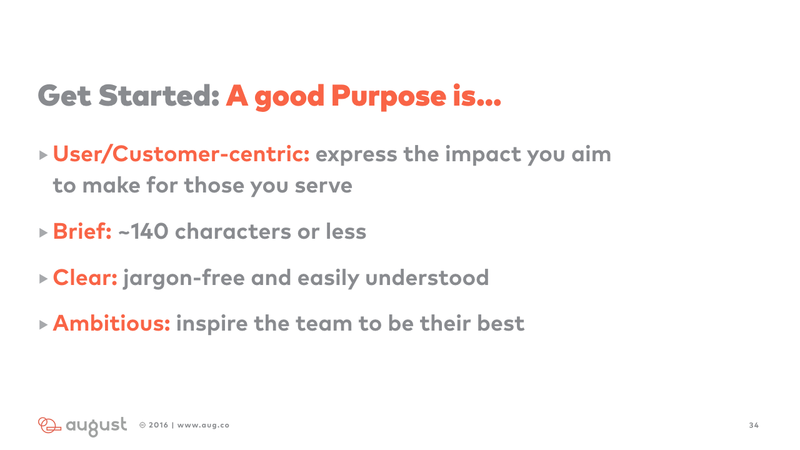 A beautifully concise, specific, and inspiring purpose statement. And then they did it! Certainly not all by themselves, but they did play a huge role. And this purpose statement lasted them quite a long while. Certainly not as elegant as “a computer on every desk”, but as I said, a purpose statement doesn’t have to be perfect. It just needs to be useful. And I would argue that if you look at what Nadella has been able to pull off since he took over, this purpose has been successful Microsoft. It comes through in decisions like developing a version of their Office suite for iPhones and iPads. Something that would have been heretical under Nadella’s successor Steve Ballmer, Microsoft quickly rolled out high-quality and quickly-adopted new version of their office suite for Apple users. 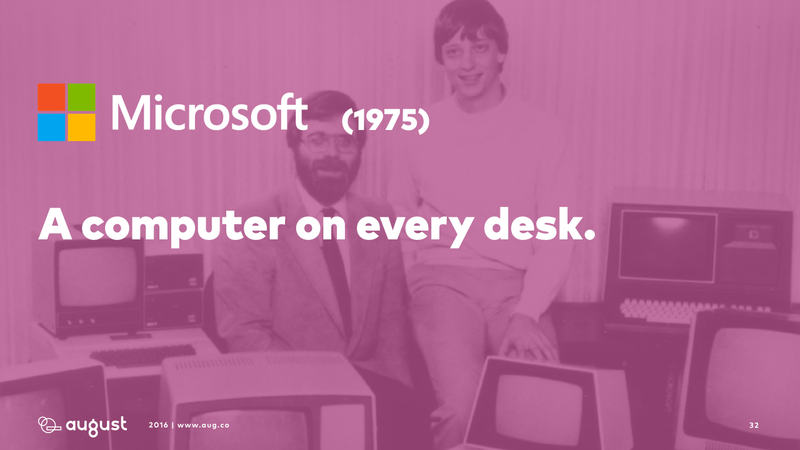 And it was good for users, and good for business. Remember it doesn’t have to be perfect. It has to be useful. It should give you some clarity about what you need to start doing, and what you should stop doing. Being open is about making it as easy as possible for anyone who is committed to your purpose to access and share information that might be useful. When you live in a world where we are overwhelmed with data, it’s actually counter-productive to try to have some centralized person or people acting as traffic cop and trying to predict which information will be most useful to which person or team. Responsive organizations look for every chance they can to ‘default to open’, and start by making information as easily accessible to as many people as possible. 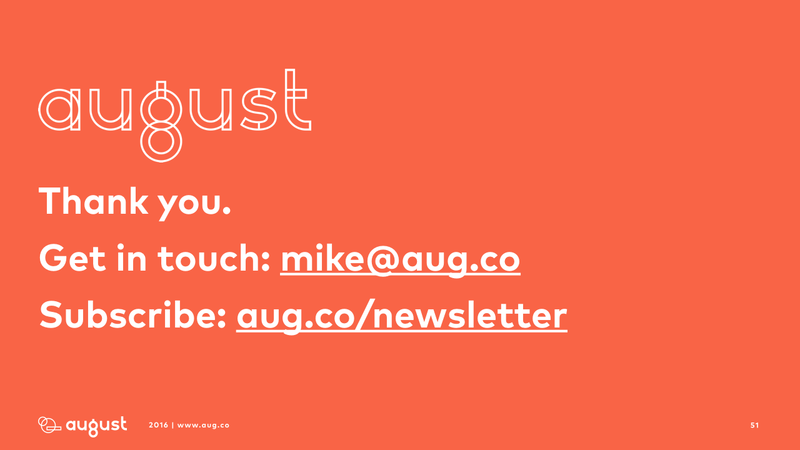 At August, one of the ways we do this is with our public Google Drive. We created a folder — that is linked to from the main navigation on our website (you can go there right now) — that contains as much information as we can share there. You can see our revenue and profitability. You can see our equity shares and our salary and compensation. You can see all of our IP (even as we create it), everything we know about how to do what we do. You can see all of our marketing strategies and resources. The only stuff that is not in there is our client’s own proprietary information. The reason we share so much is because we don’t know who out there might be able to help us achieve our mission. And we want to make it as easy as possible for them to help us. 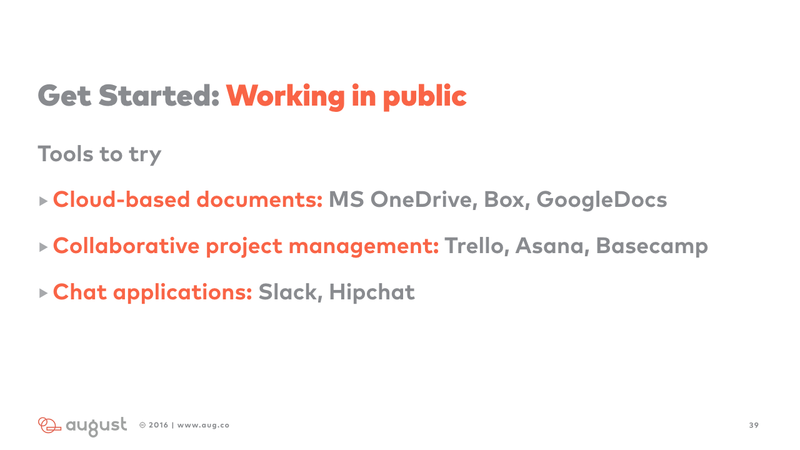 Percolate is a successful marketing software startup. One of the things that they’ve done to increase openness is they build a special internal application — called Barista — that collects questions from customers and employees and automatically routes them to people who are best suited to provide an answer. If a sales person is out in the field and gets a question from a potential customer, they’re able to send that question back into the system and get an answer right away. And, best of all, this is a growing database. All questions and answers are captured and saved. At the end of each week an email goes out to the entire company with the latest questions and answers from that week. 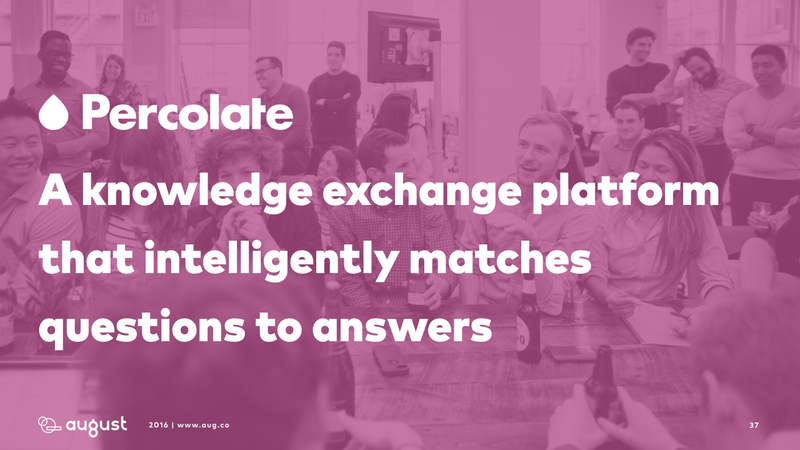 And over time, this turns into their own internal Wikipedia, where any employee — especially new employees — can quickly get an answer to almost any question they can think of. Zara has brought this behavior to fashion retail. When customers return items, someone at the store collects information about why they’re returning the item, and that information is sent back to a centralized database that all of Zara’s designers have access to. And those designers are then empowered to turn the trends that they see in that data into new products on racks in a matter of weeks. 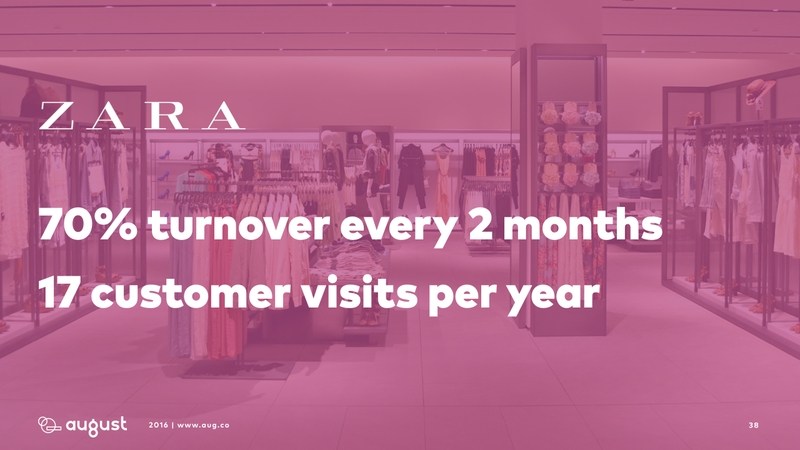 As a result, Zara enjoys an inventory turnover rate of 70% every two months, and customers who average 17 visits per year, compared to the industry average of only 3 visits. We like to call this practice “working in public,” and there are many great and easy to use tools that can help you start to work this way. Cloud-based collaborative documents like Microsoft OneDrive, Box, and Google Docs. Chat applications like Slack and Hipchat that can replace nearly ALL internal email. Learning is about what you do with all this information. How do you improve continuously? 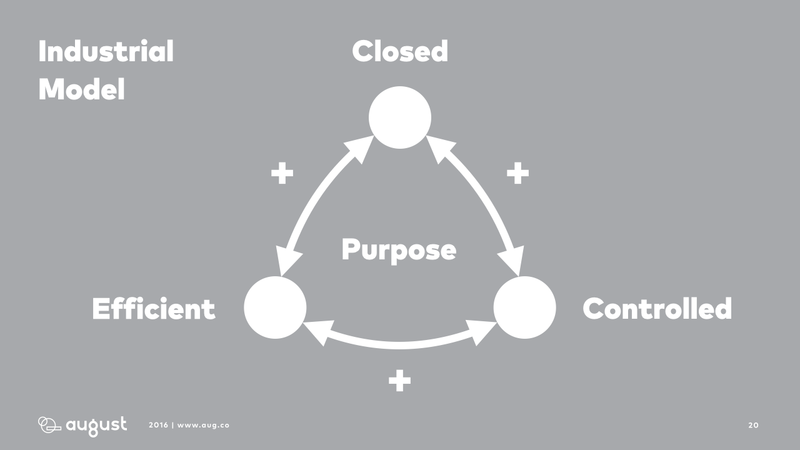 Responsive organizations create processes and systems that ensure that every project and every team is constantly reflecting on what’s working and what’s not, and adjusting course as necessary. 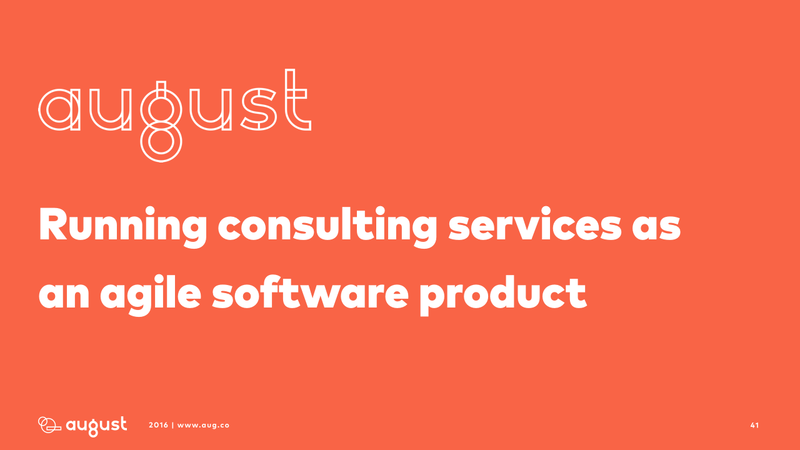 At August, we run our consulting business as if it were an agile software product. All of our projects run in 4 week cycles, on the same calendar. Meaning that projects start and stop on the same dates. 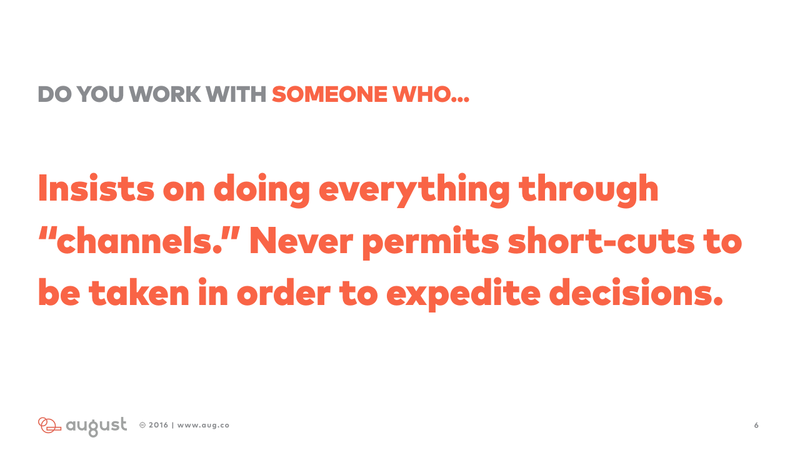 And if we need to move people from one project to another, it’s much easier to do that without disrupting the delivery. And when we work on big, long-term projects that sometimes take a year or more we have a built-in check point every 4 weeks, where we and our clients can assess how things are going and adjust the scope as needed. 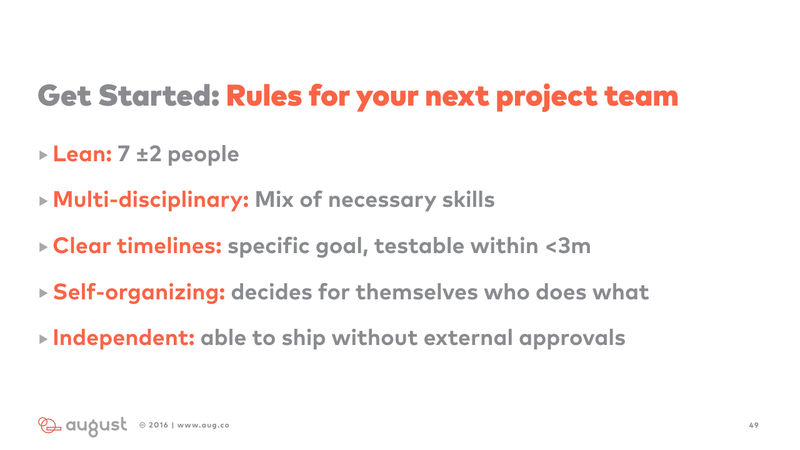 Within these 4 week cycles, each project team runs in 1-week sprints, where they reprioritize their work each Monday and ship an iteration of their work every Friday. 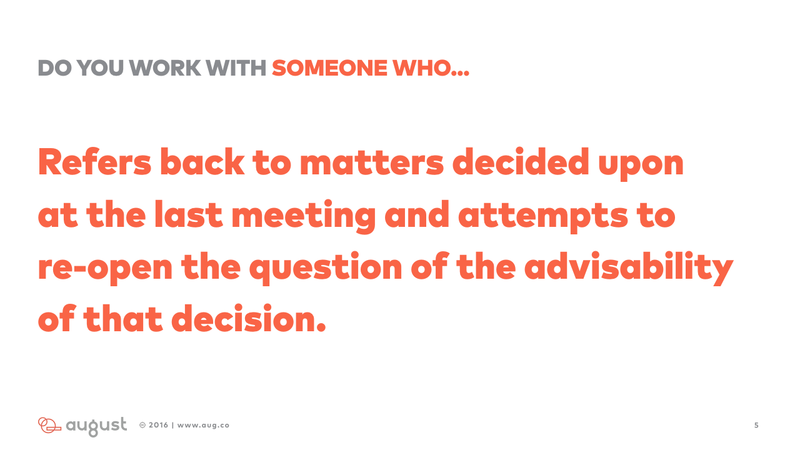 And what we hear from our clients is that working this way makes us essentially twice as effective in half as much time as a normal consulting partner. Amazon created an internal platform for experimentation called Weblab. 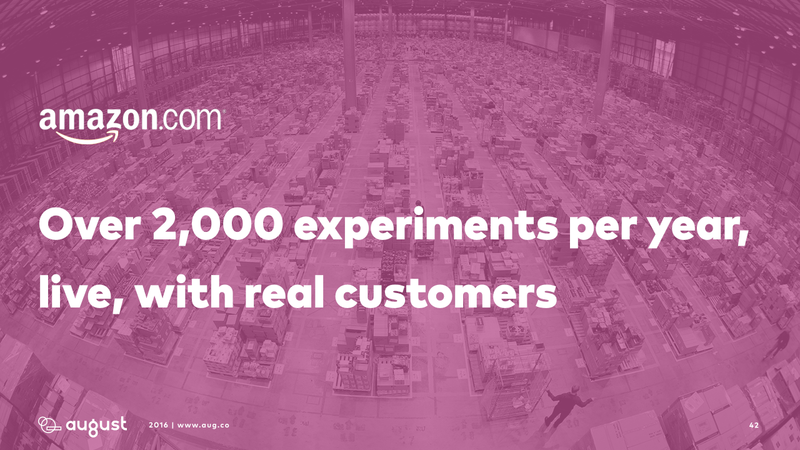 Weblab allows any developer or product team inside Amazon to create and deploy experiments on the live website with real customers. They run over 2,000 experiments per year. And these experiments have led to all kinds of useful new features. In 2013, they prototyped, validated, and launched a simple solution called “Ask an Owner” that routes product questions from users considering a purchase to customers who have already purchased the item. 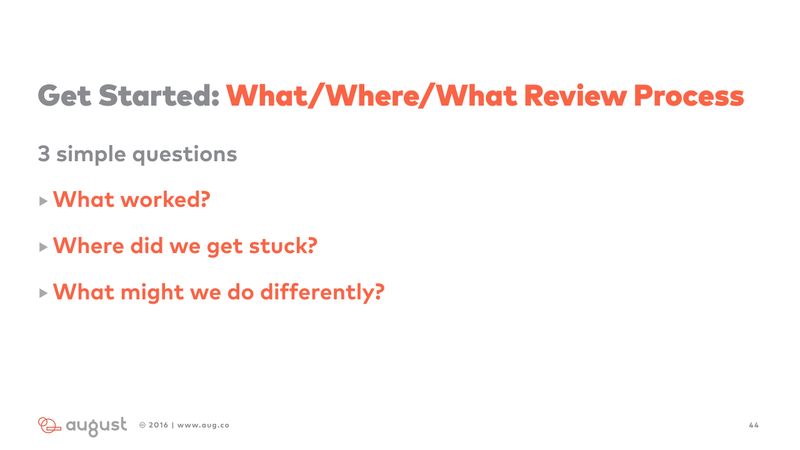 In less than a year after it launched, millions of these questions were asked and answered. 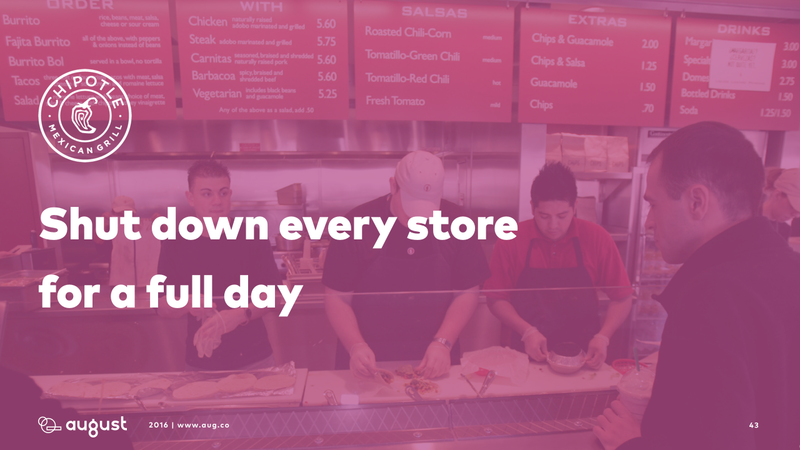 In February 2016, Chipotle, a popular burrito food chain in the U.S. shut down over 1,900 stores for an entire day. They had been dealing with a food safety scare that was threatening to do some lasting damage to their brand. And they gathered all employees for an entire day, retrained them on food safety practices, and did a virtual Q&A with their CEO. This willingness to take such sweeping and swift action says a lot about their commitment to learning and continuous improvement. 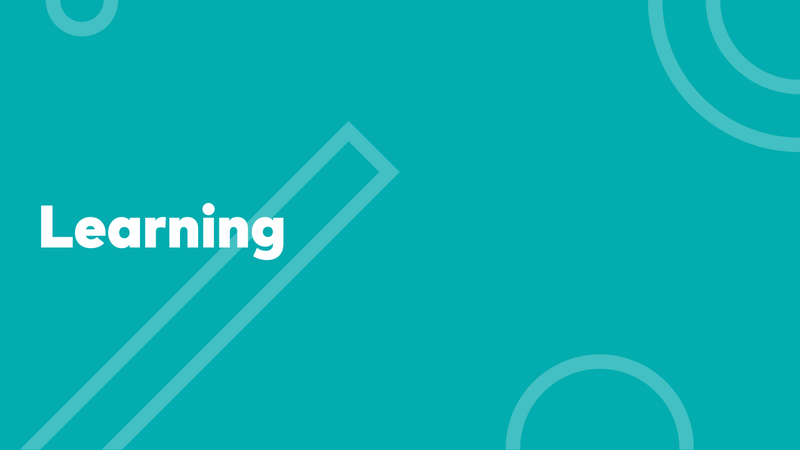 Here’s a super simple way to get started, and to bring a continuous learning mindset into your team. Where did we get stuck? Network is about empowering people to help you achieve your purpose — regardless of who they are or where they are in relation to the organization. This means breaking out of the limits of the corporate hierarchy, working across regions and functional silos, and even breaking down cultural and societal boundaries that can get in the way. 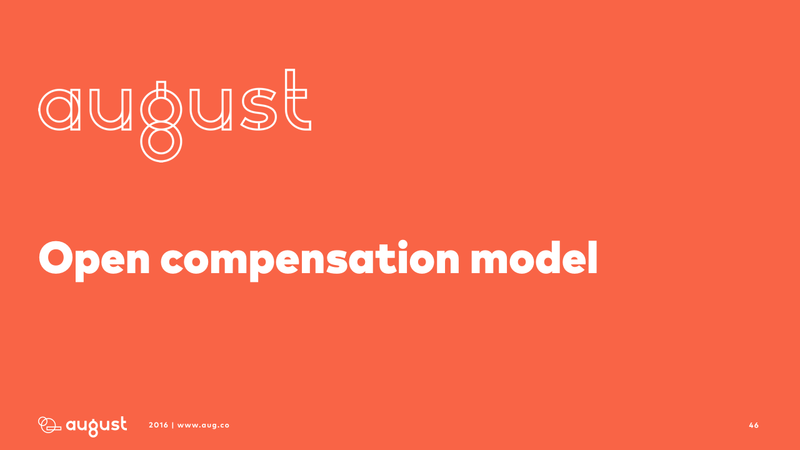 One of the ways that we do this at August is with an open compensation system. Everyone can see what each other makes. And, even more importantly, everyone is empowered to make sure that they are fairly compensated, and that we hold each other accountable for making sure that the system is fair to everyone. Even the most junior person, or the newest person on the team is invited to participate. 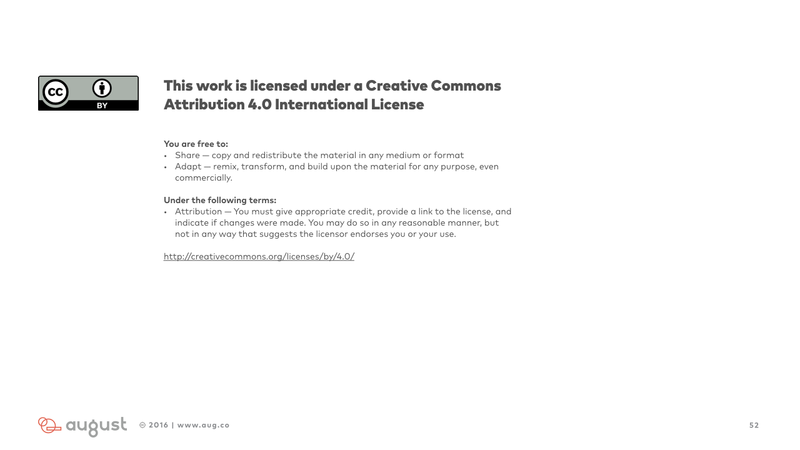 And, we’ve made our compensation model open to the public. Already other organizations are taking it, using it as a reference to build on, and then creating new iterations of the system for us to learn from and incorporate back into our own version. The network helps us to learn and improve faster than we would be able to by ourselves. One of the projects that I’m most proud of in my career is a project that I worked on back at Undercurrent with GE. Recognizing how digital fabrication technology was going to make it easier for hardware engineers to work together in a more networked model, GE wanted to explore new platforms for this kind of collaborative engineering. We introduced GE to an open online engineering community called Grabcad, which now has over a million engineers from all over the world working on all kinds of different projects together. We got together with some product designers at GE Aviation, and we selected a bracket that goes inside one of GE’s jet engines. We shared the performance specifications with the Grabcad community and challenged them to see if they could come up with better designs. In a month we had over 700 designs. Orders of magnitude more than GE would be able to generate internally through their usual process. The winning design had an over 80% weight reduction. 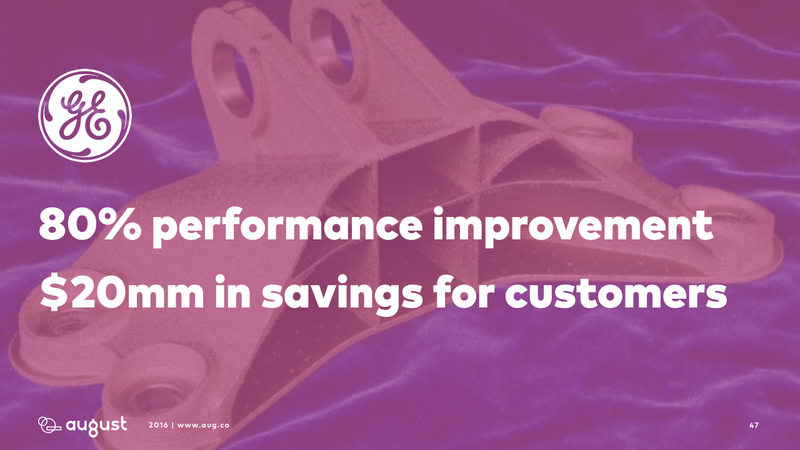 Which translates into over $20 million in annual fuel savings costs for GE’s customers. And, best of all, the person who designed the winning part was a 20 year old kid from Indonesia who had never done any aviation engineering before in his life. He works at GE now. Peter Aceto is the CEO of Tangerine Bank in Canada, and he actually published a book last year advocating for this same way of working. Tangerine Bank has empowered their local retail branches, giving them tons of autonomy and minimizing the bureaucracy and middle management between them and the corporate headquarters. And, as a result, they are actually seeing exponential returns compared to their competitors. 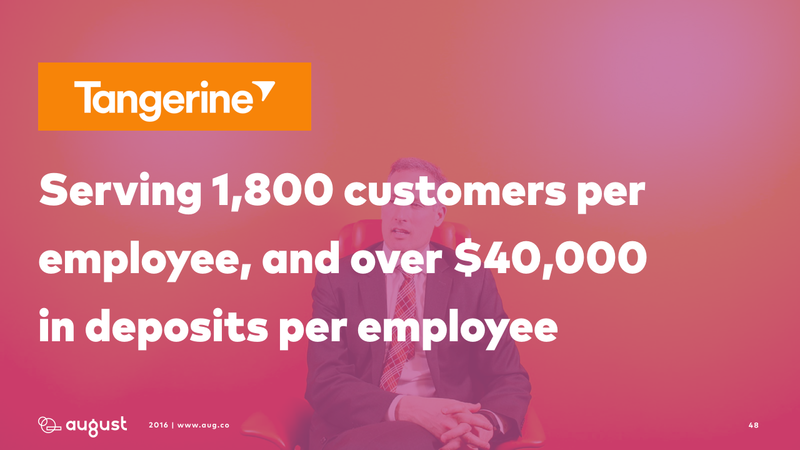 Tangerine is able to serve 1,800 customers per employees compared to an industry average of just 250. And they handle over $40,000 in deposits per employee compared to an industry average of just $10,000. Most organizations are optimized for certainty, when they need to optimize for uncertainty. 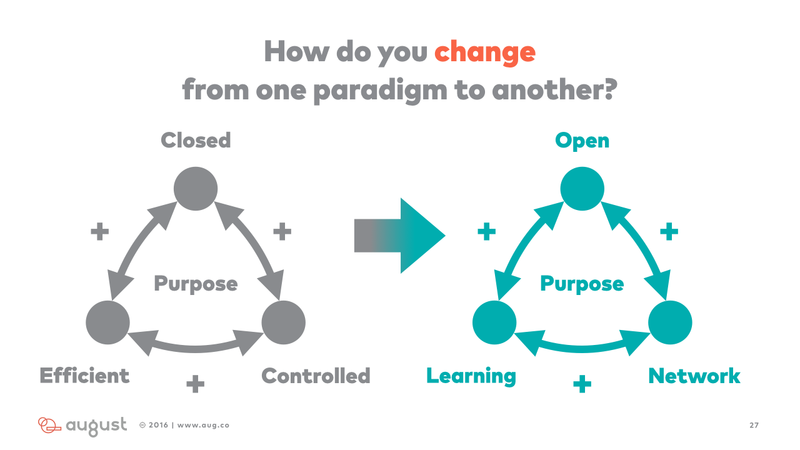 But there’s a way to change that by harnessing open learning networks to pursue a purpose beyond your bottom line. The organizations that embrace this shift are starting a revolution that will change the lives of hundreds of millions of workers and ultimately will change the world. I hope that you’ll join this revolution. This work is licensed under a Creative Commons Attribution 4.0 International License. We encourage you to take it, present it, change it, and share it with others. 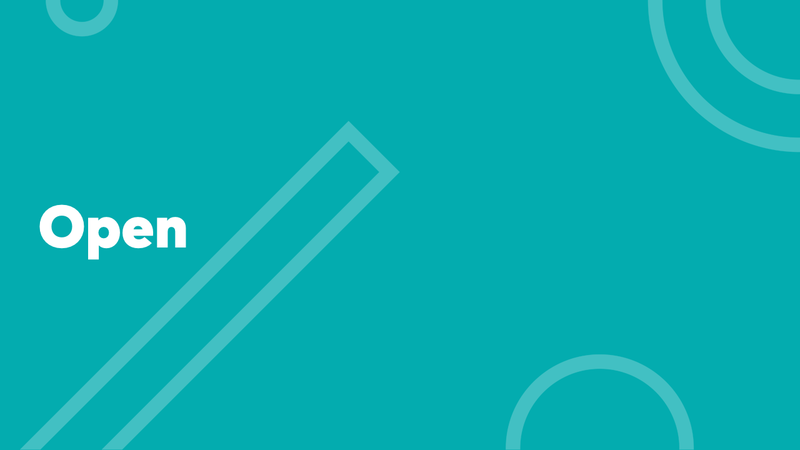 If you care about making the future of work more human and changing the way organizations operate, subscribe to our weekly newsletter and get in touch.